Back again with our favorite website...(well at least every two weeks.) Anyway, this week's feature is kinda discriminatory. Well, actually it's not just kinda, it is discriminatory. Yup, even in the 90's folks, in the modern Western..er...Asian world, there is still discrimination against...women. This week's store is not a restaurant, but a barbershop/hair salon. 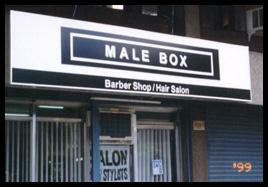 What's discriminatory about it is that it only allows men inside. "That's outrageous!" You women out there are probably thinking. "It should be burned to the ground!" "The owners should die a horrible death!" "Destroy those chauvinists!" Whoops...excuse me - too much coffee in my system. Anyway folks, check out the barbershop/hair salon in Quezon City. And I'm sorry, there's no lady's night.